Buy your Le Cheile kit online! Le Chéile would like to say a big thank you to Iarnród Éireann for the use of their car park on Saturday April 13th when we hosted the Kildare Juvenile League. It was very much appreciated! 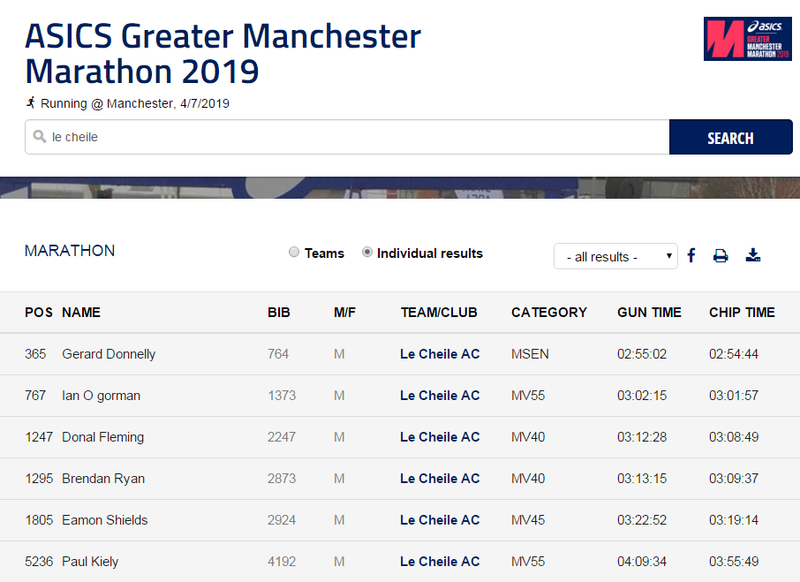 It was a great day for Le Chéile AC at the All Ireland national 10k road championships, part of the Great Ireland run in the Phoenix park yesterday. Brian McGrath was crowned All Ireland champion in his masters category. A brilliant gutsy effort after recent injury niggles. Our ladies +35 team (Jan Corcoran, Lisa Hughes and Orlaith Nason) took home All Ireland bronze. Brilliant going ladies! Nicholas Walsh, Paul Foy, Karen Croal, Deirdre Dowling and Louise Corcoran also had fine runs in the event.